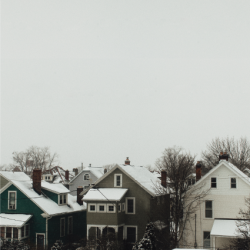 Planning For Burial release their third album, Below the House on 10th March via The Flenser. Second album Desideratum was one of the first albums we reviewed back in 2014 so it’s only natural that we’d have to get this review in. If you’re not familiar with Planning For Burial they’re part of their own unique genre, ‘gloom’ which can be seen as blend of slowcore, shoegaze, doom, 90s alt rock and drone. Below the House is more akin to 2010’s debut Leaving – an introverted work characterized by its heavy dynamics and personal obsessions. Likewise, Below the House is a work that feels just as dark and private. Since the beginning, Planning for Burial has been a solo endeavour. Thom Wasluck has been recording music himself and touring extensively as one-man band, playing hundreds of shows in DIY spaces and nightclubs, where he has shared the stage with acts like Deafheaven, King Woman and Chelsea Wolfe. Both incredibly loud and intimate, Planning for Burial plays with an unrivalled passion and funereal grace that is equally at home in basements and large venues. Below the House is an album for you to get lost in, let the heavy drone encapsulate you and cart you to dark and introspective places. Haunting, emotive and chilling throughout you’ll find this to be a challenging but ultimately very rewarding album. Whether it be the dark drone of ‘Threadbare’ or the diverse and sprawling ‘Somewhere In The Evening’ or bleak dream pop introspection of ‘Warm of You’ there’s something in every track that you can relate to any fall in love with. The latter of the aforementioned three tracks is especially worth of praise. Somehow it manages to blend elements of The Cure, Deafheaven and Beach House to come out in a gloriously dark yet instantaneous track. The feedback style drone of ‘Past Lives’ feels like a lifetimes worth of pain and turmoil condensed into 3 and half minutes while ‘(something)’ ramps up the emotion with the tender drone and shoegaze tones feeling as if they have a gateway to your sole. ‘Dull Knife PtI’ ramps up the doom with barrage of deathly heavy guitars before ‘Dull Knife PtII’ turns the doom into lighter post-rock tones creating a subtler layer of emotion. It’s the album opus and the go to point if you’re feeling adventurous. Album closer and title track ‘Below the House’ touches on NIN style minimal industrialism, creating a surreal and diverse dynamic. This is Planning for Burial’s strongest work to date. Challenging at every junction it isn’t for the casual listener. Give it your full attention, let it come to the fore and let it take you to your darkest corners.